Yummy Baby Shower Cookies and Baby Shower Cookie Favors to make for a Scrumptiously Sweet Baby Shower. Cookies are a delicious addition to your baby shower dessert or make adorably wrapped favors. Carry your theme from the cake to the cookies. Add more sweetness with cupcakes and candy too! Wrap your cookies up as baby shower cookie favors or use them to decorate your cake table and serve to your guests. From designer cookies to homemade cookies, we have some fun ideas! These beautifully custom designed, generously sized cookies are perfect for a baby shower. Made from a classic butter cookie recipe with a touch of almond, each cookie is handcrafted with great care. Chewy on the inside, each one is hand decorated with royal icing that dries into a sweet crunchy topping. Impress your guests with these delectable treats. Designer Baby Shower Cookies ... Designer Cookies at Beau-Coup! Arrange your cookies on small plates around the cake, or on the coffee table. Again, these are a perfect decorative touch for your unique baby shower decor. The great thing about these decorative cookies is that you can also use them as Favors. Wrap in a decorative plastic, tie with a colorful ribbon, and place them in unique baby shower favor bags, or a baby shower favor box. Find more Easy DIY Favor ideas on our Homemade Baby Shower Favors page. Find adorable baby shower cookie ideas and cookie "cousins" from which to choose. Serve them to your guests, or they're really darn cute as favors! With quite a few unique baby shower cookies to choose from, we know you'll find the perfect design or combination of designs for your theme. From "Baby Brownie Pops" and "Two Tier Mini Cakes", to "Shower Cookies" and "Shower Muffin Mix" ... and they come personalized too! These Hand Decorated Baby Shower Cookie Bouquets make amazingly decorative table centerpieces. They also make a lovely "welcome home" gift for Mom when she returns home from the hospital. More adorable decoration ideas for a table centerpiece. Tip: Get a picture of Mom-To-Be and have these photo cookies individually wrapped for perfect baby shower cookie favors. Discover lots of amazing cookie designs for your baby shower favors that your guests will love! Having A Seasonal Baby Shower? Winter, Spring, Summer or Fall themed baby shower! Baking Your Own Baby Shower Cookies? If you're going to make your own cookies, remember your time factor when taking on these extra tasks. Some of these decorative cookies require a chunk of time. Do you have a creative co-host, or maybe Mom-To-Be wants to be "hands on"? Either way add it to your baby shower planning time-line. Tip: Make your baby shower cookies well ahead of time, cover them and freeze on a flat cookie sheet or flat container with a tight seal. Make sure you put spacers in between so you don't crush them. Freeze them fresh and they will taste just as good as the day you made them! 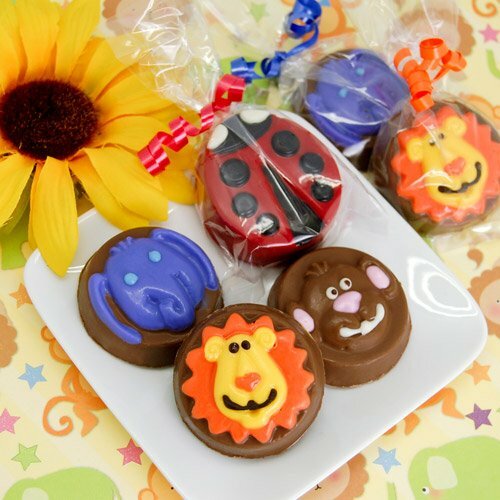 They have created over 100 designs of cookies for baby shower gift baskets and personalized cookie gifts, perfect for baby showers as gifts or favors. They make all of their cookies from scratch and bake them in their kitchen ovens. Find a Local Bakery to create these scrumptious ideas with our Baby Shower Cake Ideas Bakery Locator!